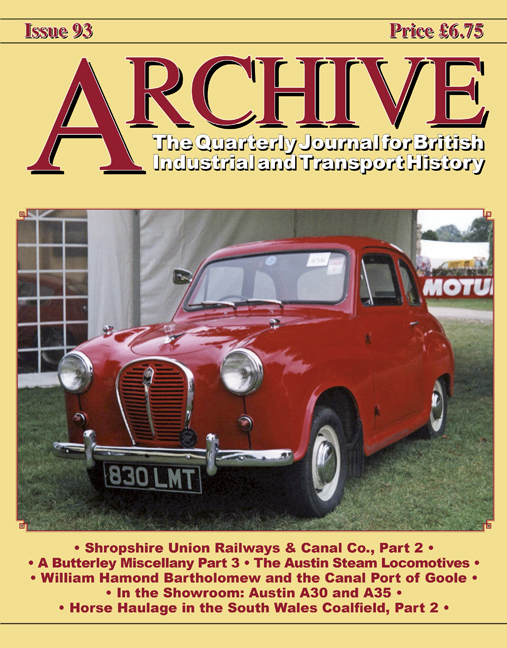 Contents: Waterways of the Shropshire Union Railways & Canal Co. Part 2 by Euan Corrie, p3; A Butterley Miscellany Part 3 by Ian Pope p15; William Hamond Bartholomew and the Canal Port of Goole by Mike Fell OBE, p27; The Austin Steam Locomotives by Andrew Neale, p35; In the Showroom: Austin A30 and A35 by Malcolm Bobbitt, p43; Horse Haulage in the South Wales Coalfield Part 2 by Paul Jackson, p51. 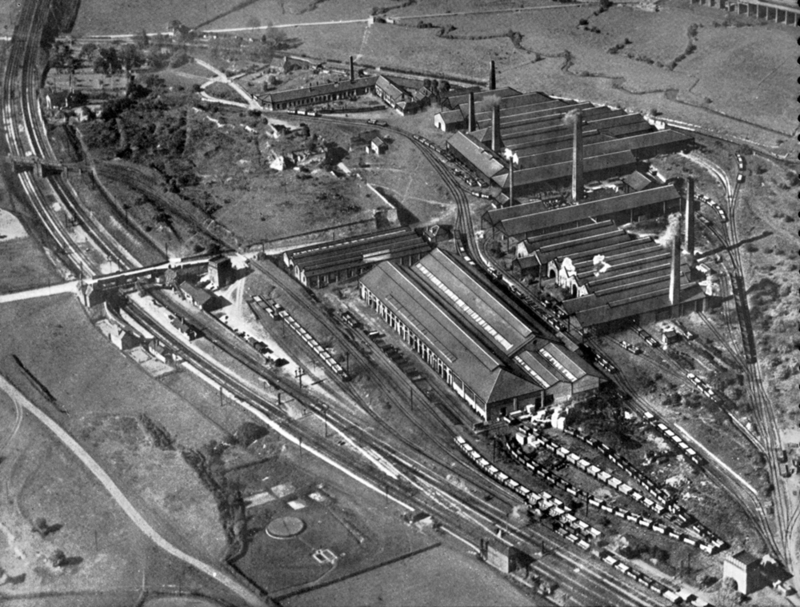 From: A Butterley Miscellany Located at Codnor Park, to the east of the main site and connected by the company’s own private railway line, were the Codnor Park Works consisting of forges and rolling mills which produced high class wrought iron, tube, strip bars, angles and tees. horseshoe bars tie bars etc. There was also the Railway Wagon Works. Not only were many wooden-bodied wagons built and repaired here for Butterley but for other owners as well. Pit tubs were also produced here and Butterley became well-known for ones produced using the ‘Butterley Patent’ method of construction. This was based on ingenious interlocking corners – which joined together the bottom, side and end plates – and a folded-over top belt. An image of one of these wagons is seen below. The method was also applied to main line wagons. 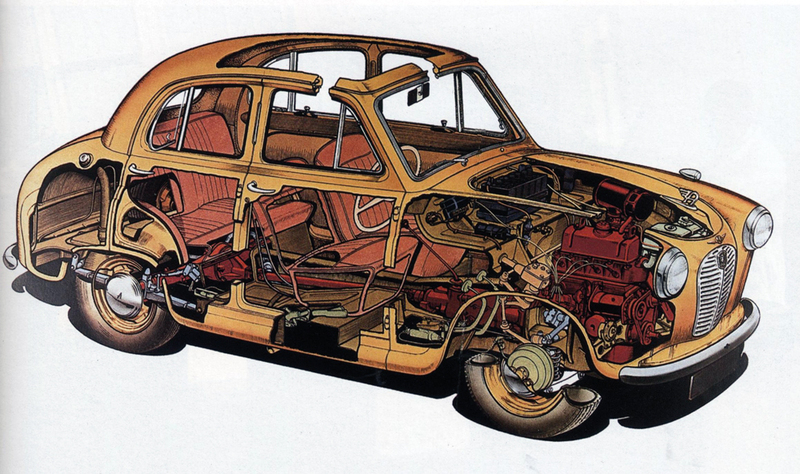 The main advantages were the ease of construction from standardised parts which also allowed for easy repair when required. The system also gave immense strength to the wagons. The parts of the colliery tubs slid together and were then bolted. The main line wagons were welded. The works were situated alongside the Midland (later LM&S) line and their Codnor Park Station can be seen on the left. Running round the back of the works was the Cromford Canal which can just be discerned in the photograph. Crossing the main line beyond the station is one arm of the Butterley Mineral Railway whilst a second goes under the Midland lines further on. At the extreme top right is a glimpse of the Great Northern (later L&NER) Pinxton Branch on which was located Codnor Park and Selston Station. Neither station was particularly well situated for the village of Codnor itself.